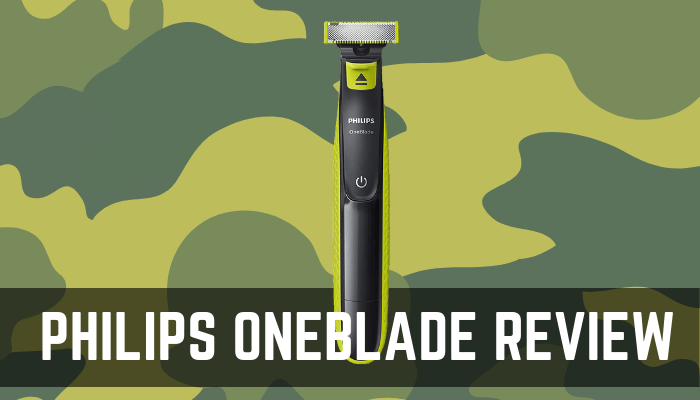 Philips OneBlade Review – A Shaver and Trimmer 2 in 1? We all know that Philips is one of the best brands that make personal grooming products. We’ve reviewed quite a few of Philips Products, including their famous QT4011 Trimmer, compared their trimmers, and even their shavers. As we’ve mentioned in our piece of difference between shaver and trimmer, shavers and trimmers are different products. Shavers can only give you a clean shave, while trimmers can just work with a stubble. This isn’t great for people who alternate their looks between clean shave and a stubble, as they would have to have a trimmer, and a shaver for both of these scenarios. The Philips OneBlade changes that. It’s a revolutionary new grooming product that is a shaver, and a trimmer, a 2 in 1 product. On paper, it definitely looks good, but does it deliver on what it promises? That’s what we’ll find out in this Philips OneBlade Review. What is the Philips OneBlade? 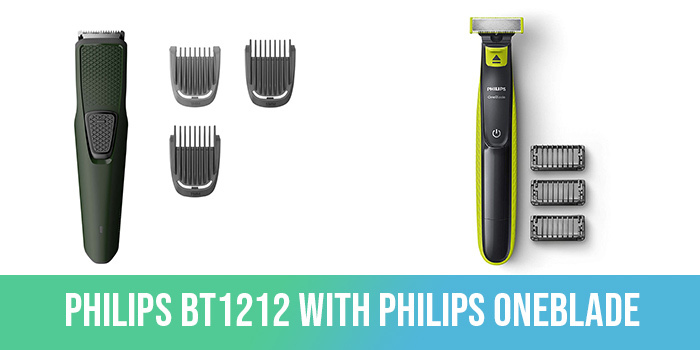 As we mentioned, the Philips OneBlade is a 2 in 1 product that does the job of a trimmer and a shaver. That means that you can use it to maintain your stubble, or get a clean shave, which was not possible with a single device earlier. The Philips OneBlade achieves this feat using its unique OneBlade technology, which offers a single blade with twin heads. A picture is worth a thousand words, so here is a side-by-side comparison of the two. Philips claims that because of its innovative design, it gives better control over the trimming process, allowing for better control, and thus better contouring. In our experience, the dual-sided blades will definitely offer more control over the trimming process and make it easy to shape your beard. From the surface, it might look like it, but there are plenty of differences between traditional trimmers and the Philips QP2525 OneBlade. The most obvious difference is that the Philips OneBlade is both a trimmer and a shaver, while a trimmer is, well, a trimmer. The next major difference is trimming length. On most trimmers, you get a wide trimming range, starting from 0.5mm to upto 10mm. Since the trimming can be extremely precise, you can style your beard in complex ways. On the other hand, the Philips QP2525 OneBlade offers only 3 trimming lengths, using individual combs. 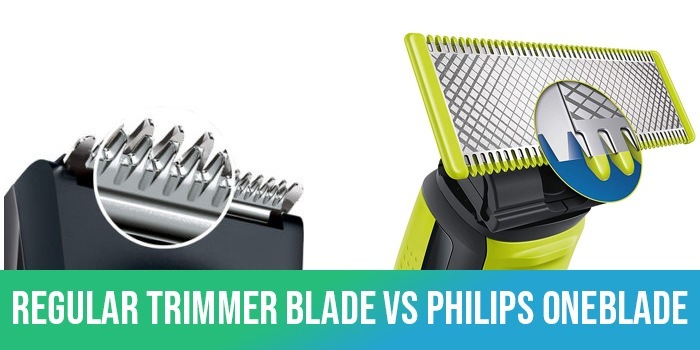 This is not the first time Philips has done this; there are a few other trimmers where Philips also includes individual combs instead of a rotating blade. Refer to the image below for an example. Now, most people will be ok with 3 trimming lengths and will be able to maintain a great beard. But the problem is also the combs themselves. As there is no carrying case included, it easy to lose these combs. If you do, spares will be hard to find, and you will be stuck with only a shaver. If you can manage to carry the combs, or just put one on and never take it off, you shouldn’t have any trouble. The last and an important difference in our opinion is the wet and dry use. Most dedicated trimmers only recommend dry usage, and many people get burns and skin irritation while using them. The Philips QP2525/10 has a huge advantage here as not only does it allow wet usage (you can use with water and shaving cream or foam), but it also has a protective element on the top that protects the skin. The difference will only be apparent after you use the OneBlade, but the wet and dry trimming is definitely something to be excited about. As we mentioned, there are plenty of good things to talk about the Philips OneBlade. Apart from being a hybrid 2 in 1 shaver and trimmer, it can be used in dry and wet modes, which is a rarity for trimmers. It required 8 hours of charging, after which it can be operated for around 45 mins. The included AC adaptor can support worldwide voltages and can be used anywhere in the world. The Philips QP2525 is also the first trimmer for which you will have to replace the blades often. According to the official numbers, you will need to buy new blades every 4 months if you fully shave 2 times a week. More details will surface once the trimmer is used by a variety of people. Also important to note is that the Philips OnePower uses a comb-based system instead of an internal blade height adjustment system. This means that the Philips QP2525 is limited to trimming in 1mm, 3mm, and 5mm lengths. This is similar to the Philips BT series trimmers and also the Philips multi groomers. But, there is an important difference. The Philips OneBlade can be used as a dry trimmer and a wet trimmer. That means you can use shaving foam or shaving gel to trim the beard. This is pretty useful for some people who regularly get irritated skin by using trimmers on their skin. Hopefully, they will be able to trim their beards with pleasure now. Coming to the shaving aspect, the Philips QP2525 has a powerful cutter that cuts hair at almost 200 times per second. You can use the QP2525 for shaving, but Philips does mention that the shave will not be as good as a direct blade. This is intentional, as Philips has included a protective layer on the blade which helps protect the skin from cuts. According to us, the shave is great, but not excellent. Last, but not least, the Philips OneBlade comes with a warranty of 2 years, which can be extended for another year after registration. So, a total of a 3-year warranty. Here is the complete feature list of the Philips QP2525 at a glance. As you can see, the Philips QP2525 OneBlade is impressive. But, it is not perfect. Here is a healthy comparison of the pros and cons of this shaver and trimmer. If you’re interested in knowing more about the Philips OneBlade, we recommend that you visit their website and sign up. They have plenty of interesting information about the OneBlade and their other grooming products. Do join even if you don’t plan on buying the OneBlade, as you will understand what factors go into designing a good grooming product. Should You Buy the Philips OneBlade? The Philips OneBlade QP2525/10 is definitely an exciting product with some interesting features, but it does have a few downsides. Particularly, the recurring blade cost. On traditional trimmers, you buy it once, and the blade lasts a few years no problem. This gives excellent peace of mind as not only do you not spend any more money, but you also aren’t concerned with buying blades, storing them, etc., which can be a task in itself. Based on the information provided by Philips, you will have to replace the blade every 4 months. In the fine print, it is also mentioned that it is based on a test with 2 shaves a week. Based on those numbers, if you shave 6 days a week, you might have to buy a blade every month! Then comes the issue of the blade price. Currently, the only replacement blade available on Amazon costs more than the Philips OneBlade! Upon investigation, we found that it’s being sold on Amazon.com and also listed on Amazon.in, so we can’t be sure of the price until the blades are officially available. But, even if the blades are half of the current price, it will still be expensive to replace every few months. In the best case scenario (where you replace the blade every 4 months), you would have to buy blades 3 times a year. If a single blade costs 1000 Rs, then the cost of blades would be 3,000 Rs, which is still higher than the cost of the OneBlade system. So, final words. Is the Philips OneBlade Good? Yes, it is. Is it cheap? No. So, if you’re looking for a cheap trimmer and shaver, this is not the right one for you. You are better off buying a grooming kit instead. But, if you’re a frequently, like a good trimmer, and can afford to spend a little money, the Philips OneBlade is awesome, and you should definitely buy it. What are your thoughts about the Philips QP2525/10 OneBlade Hybrid Trimmer and Shaver? Let us know in the comments.